"What makes this inquest significant is that these prisoners represent sinister influences that will lurk in the world long after their bodies have returned to dust." So spoke Robert H. Jackson, the chief American prosecutor at the trial of German leaders in Nuremberg that began on November 20, 1945. The war in Europe had ended with the Nazi surrender in May. Hitler was dead, together with several other Nazi leaders. Some of the Nazi elite had fled, many had been rounded up by the Allies. In the advances through Poland and Germany, Allied troops had uncovered the hidden horrors of the Nazi concentration camps. Now that the grim evidence of the Nazi "Final Solution" lay open for all to see, many Europeans thirsted for revenge. Convinced that Hermann Goering and other Nazi leaders had clearly committed crimes against humanity, influential Soviet and English leaders insisted that the leaders of this reprehensible government be summarily tried and hanged. Judge Michael Musmanno, circa 1950. American officials, however, were resisting the cries for quick justice. Concerned that the victors did not lower themselves to a Nazi mentality, they argued for a formal legal trial, with the Nazis given the opportunity to defend themselves. 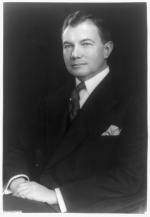 On May 2, 1945, President Harry Truman appointed Associate Justice of the Supreme Court Robert H. Jackson to take charge of the American legal team that would prepare the case against the Nazis. Jackson was born on a farm in Warren County, Pennsylvania, in 1892. His parents then moved north to Frewsburg, New York, where Jackson attended high school. He then apprenticed in a local law firm, attended Albany Law School for a year, passed the state bar exam, and became a lawyer in 1913. While practicing widely in western New York state, he came to the attention of Governor Franklin D. Roosevelt, who appointed him to a state commission in 1930. After FDR became president, he brought Jackson to Washington as an IRS legal counsel. By that time, FDR and Jackson were intimate friends and poker buddies. FDR appointed Jackson assistant attorney general in 1936, Solicitor General in 1938, Attorney General in 1940, and associate Supreme Court Justice in 1941. As chief U.S. prosecutor at Nuremberg, Jackson faced daunting challenges. The prosecution team fielded representatives from England, Soviet Union, France, and the United States, all of which had different legal systems. (Jackson's staff, many of whom were young reserve military officers, included future Pennsylvania Supreme Court justice Michael A. Musmanno.) Working with Allied occupation officers, Jackson's team scoured Germany for documents related to the Nazi regime. They also traveled to London, where with other national teams, they hammered out what became known as the London Charter in August, a document which laid out the foundation for the Nuremberg trials. Jackson was the man largely responsible for the London Charter. His view coincided with the American view that the Germans had waged a planned war of aggression and must now pay for its failure. The Nazi leaders would be charged with crimes that fell into three broad categories: crimes against peace (planning and initiating aggressive war), crimes against humanity (genocide), and war crimes (traditional violations of the rules of war). Twenty-two German leaders were selected for trail before the International Military Tribunal (Martin Bormann was tried in absentia. They ranged from Hermann Goering and generals of the German staff, to the president of the Reichsbank and Albert Speer, armaments chief. The trial began on November 20, 1945, and ended on August 31, 1946. The court called 113 witnesses and amassed millions of pages of documents, largely brought together by the American team, echoing Jackson's view to present written evidence rather than human witnesses. Rather than trumpet the Holocaust and bring in witnesses who survived, Jackson and his team were determined to show that the Nazi regime had deliberately planned to use warfare to dominate Europe. Jackson's thinking meant great changes for international law in the future. No longer was a head of state immune from prosecution. Furthermore, anyone who participated in such aggression –bankers, industrialists, diplomats, soldiers alike–might stand trial. Most importantly, Jackson ensured for future war crimes trials that those accused would be guaranteed a fair trial. 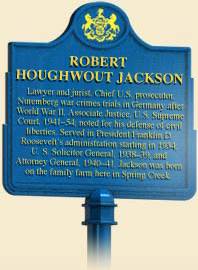 Robert Houghwout Jackson, ca. 1938. Though a gifted lawyer, Jackson's temperament underwent a severe test at Nuremberg. At first, Goering held his own with Jackson's tough questioning, and only broke after a growing trail of evidence demonstrated that Goering not only participated in the Final Solution, but also signed several key documents that set it in motion. Occasional problems with the French and Soviet teams triggered Jackson's temper, as did his squabbles with Francis Biddle, the Philadelphian who had succeeded him as Attorney General in 1941 and now served as the American judge on the Tribunal. Jackson closed the prosecution's case with an eloquent oration designed to show that the Nazis were indeed guilty. "If we cannot eliminate the causes and prevent the repetition of these barbaric events, it is not an irresponsible prophecy to say that this twentieth century may yet succeed in bringing the doom of civilization." After a month of deliberation, the judges pronounced guilty sentences on most of the defendants. Thirteen were sentenced to hang, three received life sentences, four received other prison sentences, and two were freed. Additional trials continued for years, and in fact, continue today, as more and more prison guards and other Nazis were found and brought to justice, all in accordance with the system devised primarily by Jackson and his staff. 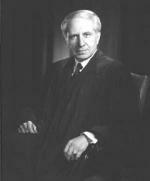 During Jackson's time at Nuremberg, Chief Justice Harlan Fiske Stone died in Washington, D.C. Besieged by supporters of both Jackson and Hugo Black, both of whom coveted the position, Truman instead nominated Justice Fred Vinson to serve as the Supreme Court's Chief Justice. Jackson remained on the court until his death in 1954. 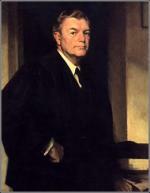 Eugene C. Gerhart, Robert H. Jackson: Country Lawyer, Supreme Court Justice, America's Advocate (Buffalo, NY: William S. Hein and Company), 2003. Bradley F. Smith, Reaching Judgment at Nuremberg (New York: Basic Books), 1977.